Lee Chapel and Museum at Washington and Lee University. 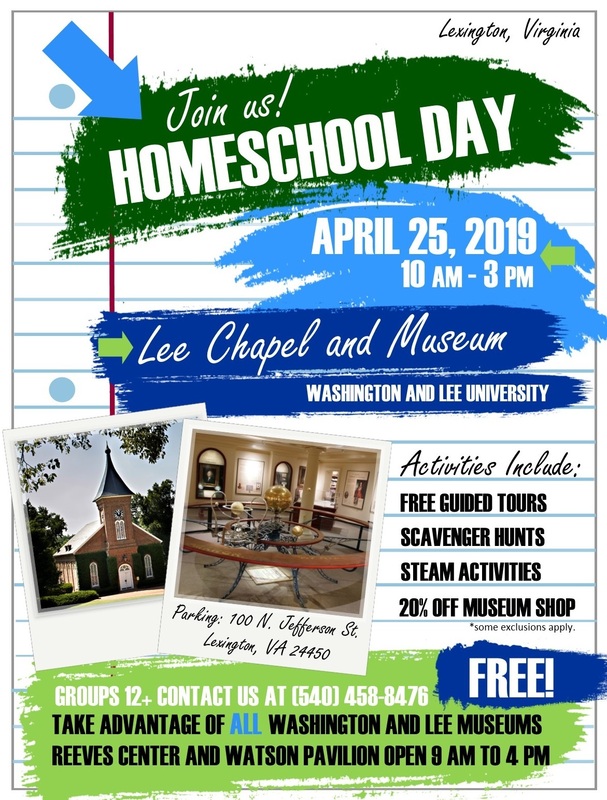 On April 25, 2019, Lee Chapel will be holding a Homeschool Day for local homeschool families. The day includes free guided tours of the chapel, scavenger hunts in the museum, and STEAM crafts. Families can take advantage of 20% off in the museum shop. (*Some exclusions apply). Best of all, it's free! This event goes from 10 a.m. to 3 p.m., rain or shine. Visitors wishing to extend their visit, can visit galleries in the Reeves Center and Watson Pavilion. Both buildings are open 9 a.m. to 4 p.m.
Groups of 12+ wishing to visit Lee Chapel should contact Cassie Ivey at civey@wlu.edu.